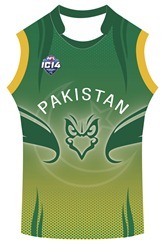 Although teams at the International Cup traditionally are representing the football competition in their country the Shaheens are a team of players that have formed in Australia, competing in local footy in Melbourne. Shaheens players are eligible to play at the International Cup as they are "amateurs who are nationals of the country they represent (Pakistan) and all players must have lived the majority of the years aged between 10 and 16 as a citizen of their nation." While we have seen teams with locally based player before this is the first time a whole team has been locally based and all learned the game in Australia. Hopefully their participation will ultimately lead to footy's growth in Pakistan. The Capital (2009 est.) is Islamabad, 832,000 pop., although not the largest city in Pakistan. The Population of Pakistan is estimated to be 193,238,868 (2013). Pakistan was one of the two original successor states to British India, which was partitioned along religious lines in 1947. For almost 25 years following independence, it consisted of two separate regions, East and West Pakistan, but now it is made up only of the western sector, the eastern sector now Bangladesh. What is now Pakistan was in prehistoric times the Indus Valley civilization (c. 2500–1700 BC ). A series of invaders—Aryans, Persians, Greeks, Arabs, Turks, and others—controlled the region for the next several thousand years. Islam, the principal religion, was introduced in 711. In 1526, the land became part of the Mogul Empire, which ruled most of the Indian subcontinent from the 16th to the mid-18th century. By 1857, the British became the dominant power in the region. Britain agreed to the formation of Pakistan as a separate dominion within the Commonwealth in Aug. 1947. The partition of Pakistan and India along religious lines resulted in the largest migration in human history, with 17 million people fleeing across the borders in both directions to escape the accompanying sectarian violence. Australian Rules football was first played in Pakistan in 2006, starting with the creation of the Australian Rules Football Federation of Pakistan, based in the Swat Valley city of Mingora. In 2007, the ARFFP renamed themselves AFL Pakistan, aligning themselves with other football bodies worldwide. Because of the current instability and unrest in that part of Pakistan, it is not known if this organisation still exists. In 2013 a group in Islamabad (Islamabad Dashers) form team and join AFL Asia. Simultaneously a group in Australia attempt to form club with intention of joining with League in Pakistan to contest IC14. Melbourne Shaheens* play in Cadbury 9’s (touch only comp) and win first match. Have recruited about 18 players by end of 2013. The Pakistan Markhors (previously Islamabad Dashers) debuted at the 2014 ANZAC Commemorative Match in Kanchanaburi, Thailand, which is hosted by the Thailand Tigers. Pakistan play South Africa, Japan and India in the first rounds of IC14, the experience of the Lions and Samurai will probably prevail over the debuting Shaheens, but they could possibly spring a surprise when meeting the Tigers, as most of the squad has been playing and training in Australia for over 12 months.